This playsuit was from the clothes swap. I love the pattern (see below :P)…pretty colours 🙂 It doesn’t look quite right done up completely up the front, hence why its open and over a T-shirt. 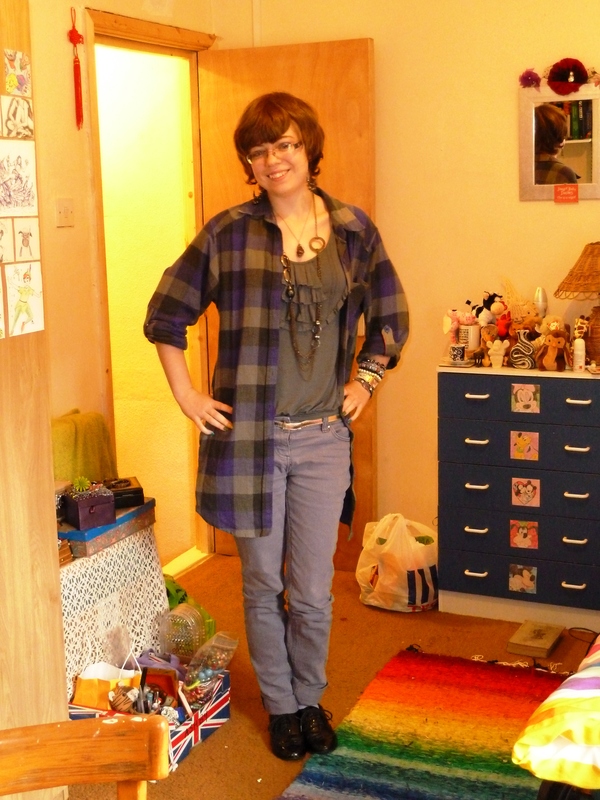 Second outfit also has clothes swap items, plus fairly recent charity shop purchases. 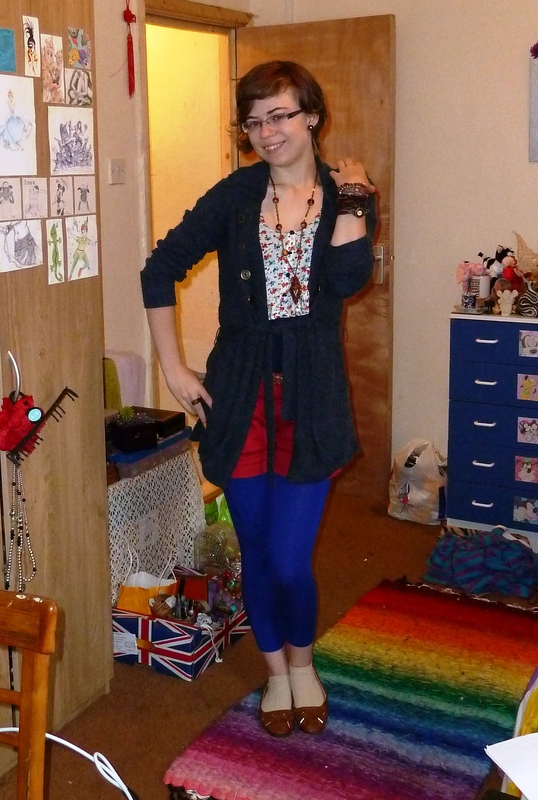 This was a really comfy outfit for sitting around reading and going to lectures. Sorry it’s a bit of an orange picture though! 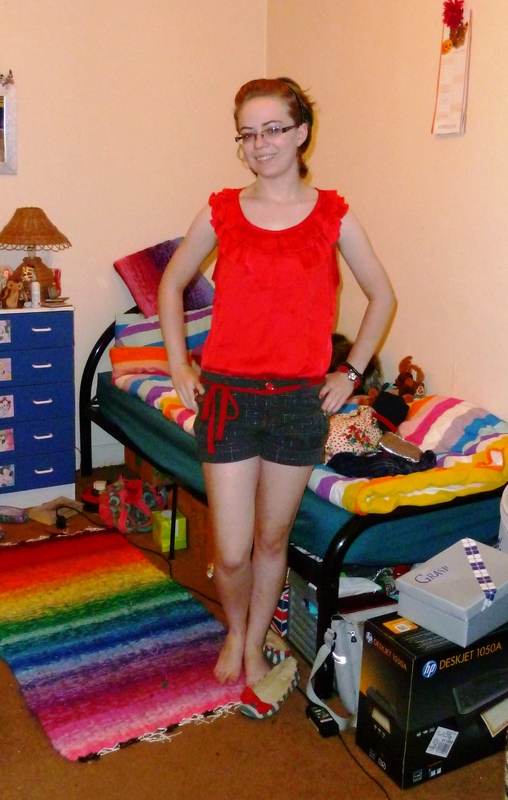 Blouse – borrowed; shorts – charity shopped; belt – tie off a dress. Lastly, a fairly generic ‘Liza’ outfit 😛 I had to pop into town, then go to a lecture, and then had dance in the evening. This worked for all 🙂 Well, I did put on a long skirt for dance, but pretty much the same. 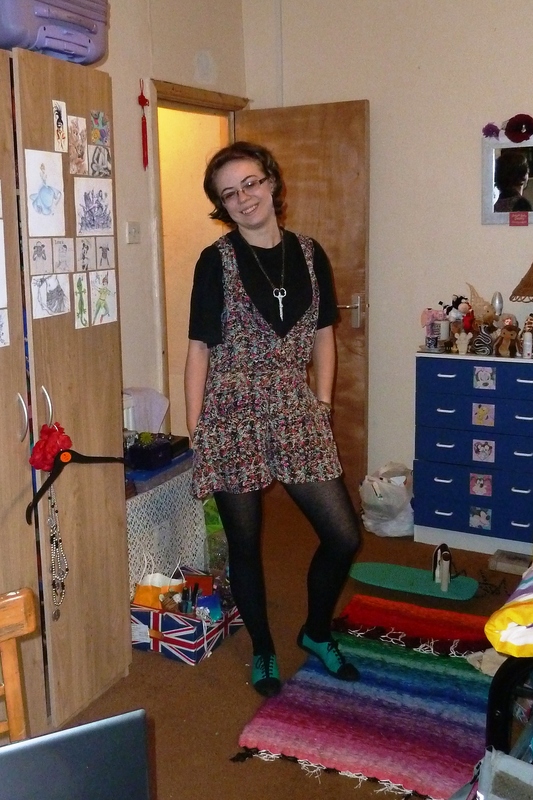 dress (worn as top), shorts, cardigan, leggings – all charity shopped; necklace – Grandma; shoes – car boot. I want to apologise for the layout of this post…I just couldn’t get it to work properly today! So it’s a bit higgledy-piggledy 😛 Also, the locations are rubbish, but I still haven’t got a tripod, and keep forgetting to ask friend to take a picture whilst we are out…so my room will have to suffice for now!! Halloween this weekend…hopefully I’ll have some pictures next week…I went out Friday night, and then I’m carving my pumpkin tonight. Anyone doing anything interesting for Halloween this year?? 1 Response to Outfits catch-up…again!